A South San Jose neighborhood is rallying to support a family after a horrific accident where two BMWs racing down a residential street ended with one of the pricey vehicles slamming into a home and seriously injuring a 40-year-old mother of two. Ping Chen, the injured mother, underwent surgery on Friday to repair her shattered pelvis and legs, according to Virginia Jennings, one of several neighbors along Leigh Avenue and Anne Way, who is coming together to help the family. Chen was severely injured on April 24 just about 4 p.m. - two hours after nearby Leigh High School gets out - when a silver BMW careened off the street and headed straight into the ranch-style home through the kitchen, where the mom was standing. Neighbors have long complained that their street off Blossom Hill Road is a magnet for speeding. 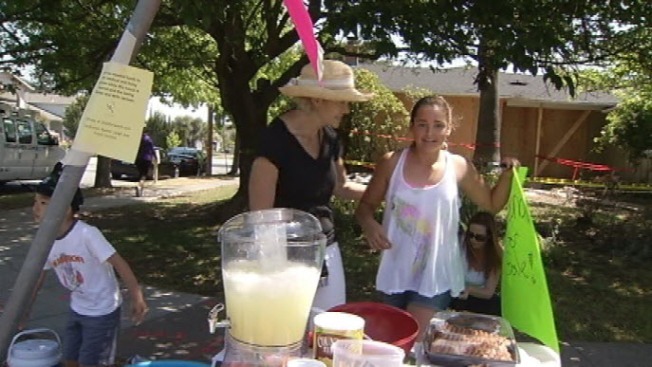 Neighbors in San Jose held a lemonade stand near Leigh High School to raise money for a mother who was severely injured after a BMW driven by a teen crashed into her home. Another lemonade stand is planned for May 4. The silver BMW temporarily buried Chen and her 9-year-old daughter. Neighbors rushed inside to pull mother and daughter out. The silver BMW was racing a red one, police and neighbors say, and the two 17-year-old drivers were charged with reckless driving and then released to the custody of their parents. Because they are juveniles, all news about their legal status is private. Jennings said that despite the magnitude of the injuries, Chen is likely to walk again: "She is expected to recover, I just can't believe it." Jim Cross, who married Chen about a year ago, is a private man, Jennings said, and chose at this time not to speak publicly about the accident. Damian Trujillo is on the scene of a violent crash near Leigh High School that sent a BMW deep inside of a home injuring several people. He did, however, give permission for Jennings to speak to NBC Bay Area on the family's behalf. She said he is especially grateful for how much the neighbors have done for him. "He has been so humble and gracious about all the support," Jennings said. Parents at school collected teddy bears, clothes, bubbles and toys for the 9-year-old girl, who was in the living room at the time and ended up breaking her arm, and her 4-year-old brother. He was in the backyard and didn't get hurt. The third grader returned to her nearby elementary school this week. Cross wasn't home at the time. He and the children, who are Chen's biological son and daughter, have been living with his sister in San Jose, Jennings said, because their house is still uninhabitable after the crash. And while Chen begins to heal, the community wanted to something. So, neighbors decided to hold weekend lemonade stands to raise money for Cross and Chen, who hails from China and loves to garden. Last week, the lemonade stand - the brainchild of 12-year-old Corlista Davison - generated $3,500. Jennings said a San Jose police officer even stopped by to drop money in the box - without even taking any lemonade. The stand will be open this Saturday and Sunday, too, and for several more weekends in the foreseeable future. "This isn't over," said Maryann Davison, Corlista's mother. "They need as much money...and support as they can." The crash has "shaken up" the neighborhood, Jennings said. "Sure, you hear about car accidents," she said, but not one in someone's kitchen." Still, Jennings said the neighbors have grown closer together. And for her part, Jennings said she has grown to really admire Cross. She likes how he is handling being a new father to Chen's children, and for his ability to get by, day by day, at his wife's side in the hospital. "He's not angry...I know I would be," Jennings said. "But I think he feels lucky that she is going to make it." IF YOU'RE INTERESTED:To donate money to the Cross Family Fund, write checks to Chase Bank, 400 No. Santa Cruz Ave. Los Gatos, under account name "Cross Family Fund," account No. 994901411. The lemonade stand will be held on Saturday and Sunday from noon to 5 p.m. at Leigh Avenue and Anne Way. NBC Bay Area's Alan Waples contributed to this report.